The department provides pathological facilities for the treatment in the various dental departments. The facilities include Haemoglobin estimation, Total Blood counts, ESR, PCV, HIV Rapid test, HBs Ag, HCV, Blood group detection, Bleeding time, clotting time, serum glucose estimation etc. 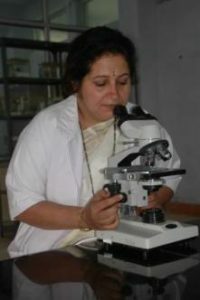 The department has all necessary infrastructure and special equipments including Autoclave, Binocular Research Microscope, Distilled water apparatus, Photo colorimeter, Monocular Microscopes, pH meter, Rectangular water bath, Refrigerator, Slide cabinets, Rotary Shaker, Electric Analytical Balance, Museum specimens, Microtome, Biopsy set, Knife sharpener, Spectrophotometer, Spring Balance, Needle Destroyer, Centrifuge, Incubator etc.